If you are looking for general information on autism spectrum disorder, this it the section for you! 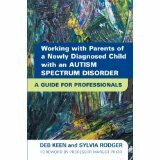 Working with Parents of a Newly Diagnosed Child with an Autism Spectrum Disorder by Deb Keen and Sylvia Rodger. This book sets out the type of support that is most beneficial to families immediately following an ASD diagnosis, and will equip professionals with the information and tools they need to best provide that support. 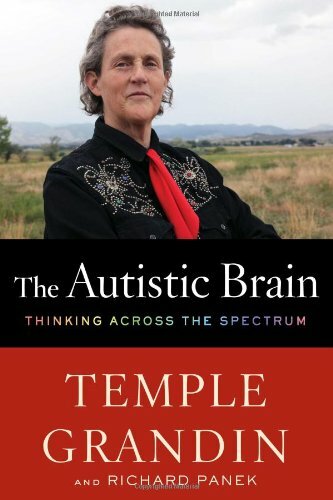 The Autistic Brain: Thinking Across the Spectrum by Temple Grandin. Weaving her own experience with remarkable new discoveries, Grandin introduces the neuroimaging advances and genetic research that link brain science to behavior, even sharing her own brain scan to show us which anomalies might explain common symptoms. We meet the scientists and self-advocates who are exploring innovative theories of what causes autism and how we can diagnose and best treat it. Grandin also highlights long-ignored sensory problems and the transformative effects we can have by treating autism symptom by symptom, rather than with an umbrella diagnosis. Most exciting, she argues that raising and educating kids on the spectrum isn’t just a matter of focusing on their weaknesses; in the science that reveals their long-overlooked strengths she shows us new ways to foster their unique contributions. From the “aspies” in Silicon Valley to the five-year-old without language, Grandin understands the true meaning of the word spectrum. The Autistic Brain is essential reading from the most respected and beloved voices in the field. 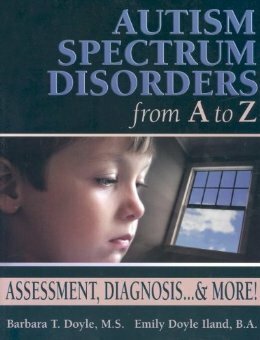 Autism Spectrum Disorders from A to Z: Assessment, Diagnosis… & More! Autism Spectrum Disorders from A to Z: Assessment, Diagnosis… & More! by Barbara T. Doyle. This extremely comprehensive book goes step-by-step through the symptoms, definitions, assessments, and diagnoses of autism spectrum disorders (ASDs). The authors describe ASDs in terms of the parents, teachers, the school system, medical professionals, adult service providers, and private agencies involved. In addition to revealing what parents and professional can expect, this book also provides practical strategies to improve the assessment process and help the child or adult deal with the stress of the evaluations. Finally, they tackle the controversial issues surrounding the causes of ASD and available treatment options. Written by the director of the Yale Child Study Center and a pediatrician, A Practical Guide to Autism is filled with advice and answers to everyday questions about living and learning with autism. This book has easy-to-access, reliable information regarding the selection of doctors, schools, services, and insurance, as well as day-to-day living in the family, school, and community. A Practical Guide to Autism also provides a detailed background on autism and related Autism Spectrum Disorders including Asperger syndrome. If available, item can be borrowed from the resource room at no cost. Asperger’s Diagnostic Assessment a DVD by Tony Attwood. This DVD features Tony Attwood lecturing on the diagnostic characteristic of Asperger’s Syndrome and describing a process for explaining the diagnosis to a child or adult. It also features an interview with a young man with Asperger’s and his parents. Disc One: 3 hours, Disc Two: 56 minutes. This video comes with 76 page program guide. Asperger’s and Girls by Tony Attwood, Temple Grandin, Teresa Bolick, and Catherine Faherty. You find in this book up-to-date information for girls and woman with Asperger’s syndrome. It covers topics such as diagnoses, education, puberty, relationships, and careers. Experts in the field share practical advice for both caregivers and the women and girls who are affected by Asperger’s. Pp. 152. Understanding Asperger’s Syndrome: Fast Facts–A Guide for Teachers and Educators to Address the Needs of the Student by Emily Burrows and Sheila Wagner. This book is a guide for teachers and educators to address the needs of the student. Pp. 29. The Oasis Guide to Asperger’s Patricia Romanowski Bashe, Barbara L. Kirby, Simon Baron-Cohen, and Tony Attwood. This book includes information on diagnosis, evaluation, medication, therapies, and social skill development. Pp. 486. This is a tool kit to assist families in getting the critical information they need in the first 100 Days after an autism diagnosis. If available, can be checked out from resource room at no cost. Or request a download here. Wretches and Jabbers a film by Gerardine Wurzburg. Two men with autism embark on a global quest to change prevailing attitudes about disability and intelligence. Autism Every Day by Alyson Beytien. This guidebook combines real-life stories of challenges and successes with practical ideas for handling autism, every day. Autism consultant Alyson Beytien outlines over 150 tried-and-true techniques for home, school, and community. Pp. 286. 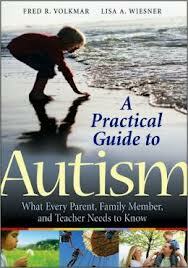 The Complete Guide to Autism Treatments by Dr. Sabrina Freeman. This book scrutinizes the range of treatment options offered to parents of children with autism so that parents can make sure that the treatment they have chosen for their child stands up to the claims made by the treatment provider. Pp. 509. Living Along the Autism Spectrum: What Does It Mean to have Autism or Asperger Syndrome? This DVD s from a father’s perspective and covers the general characteristics of a child on the Autism Spectrum, as well as touching on subjects that affect the entire family. Some of these issues include siblings, employment, grief, and culture. This DVD is recommended for parent discussion groups. 52 Minutes. A Mind Apart by Peter Szatmari. The author shows that children with autism spectrum disorders act the way they do because they think in vastly different ways than other people. Dr. Szatmari shares the compelling stories of children he has treated who hear everyday conversation like a foreign language or experience hugs like the clamp of a vise. Understanding this unusual inner world-and appreciating the unique strengths that thinking differently can bestow-will help parents relate to their children more meaningfully, and make the “outer world” a less scary place. Pp. 210. Ask and Tell: Self-Advocacy and Disclosure for People on the Autism Spectrum by Ruth Elain Joyner Hane. This book aims to help people with autism effectively self-advocate in their pursuit of independent, productive, and fulfilling lives. Ask and Tell is unique by being the first book to speak to the twin issues of self- advocacy and disclosure for people with autism and by consisting exclusively including the cover art and the preface by Temple Grandin of contributions by those on the autism spectrum for persons on the spectrum.pp.196. Autistic Spectrum Disorders: Best Practice Guidelines for Screening, Diagnosis and Assessment by the California Department of Developmental Services. Based on validated scientific evidence, clinical experience and clinical judgment, the Guidelines provides professionals, policymakers, parents and other stakeholders with detailed “best practice” recommendations and rationale for screening, evaluating and assessing individuals suspected of having autistic spectrum disorders. Pp. 183.